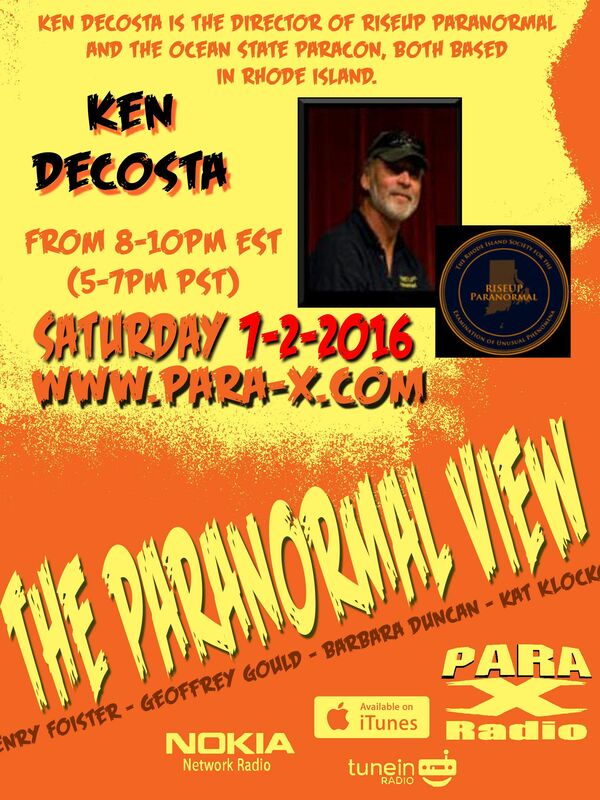 09 July 2016 "The Paranormal View"
Our guests tonight were Ken DeCosta of Riseup Paranormal [Rhode Island Society for the Examination of Unusual Phenomena], and House of Darkness: House of Light book trilogy author Andrea Perron. Ken spoke about his early love with space and astronauts, which moved into interests in UFOlogy, and cryptozoology, and eventually ghosts. His catalyst was more his curiosity, even more than an experience he'd had at age twelve, details into which he really didn't go. Andrea spoke of her teenage love of Dark Shadows. In June 1970 her mother found the farm, and put down the deposit, and off to the new place, in love with which they all fell. In January 1971 they moved in; no one experiencing anything paranormal or out of the ordinary. As the previous owner Mr. Kenyon was moving out, each of the girls saw a full body apparition that to some seemed solid, others slightly transluscent, and that was their "introduction" to the paranormal. Over the next ten years the ghost, which one of the girls named "Manny," was very benevolent, and tended to hang out in the corner of the room. Their father couldn't see Manny, but all the girls could see him. Andrea and Kat have been looking forward to the Ocean ParaCon in Harrisburg, Rhode Island the next weekend, July 16-17, which Ken and his group has organized. After the first break, Ceiling Cat Barbara Duncan reported our having listeners tonight in Singapore, the UK, the US, Costa Rica, Holland, Germany, Rhode Island, and Unknown. Ken spoke about the rise of his RISEUP group, and their methodologies of investigating. He discussed about some ghosts/locations "going silent" if a place gets "too many" investigations, usually as so many groups ask the Same Questions, becoming so very annoyingly redundant to the ghosts. Ken also indicated the Most Haunted place he's investigated being a private domicile. The impressive upcoming Ocean ParaCon was discussed. At the last second Kat's audio began to wink out as she gave out the show's Twitter info. Andrea plugged her co-author George R. Lopez's In A Flicker novel and its official inaflickernovel.com website.